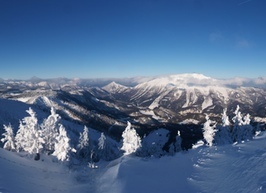 Mariazell is a small city in Austria, in Styria, well known for winter sports, 143 km N. of Graz. 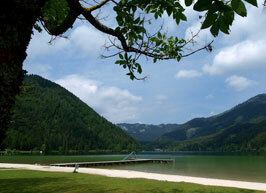 It is picturesquely situated in the valley of the Salza, amid the north Styrian Alps. It is the most important pilgrimage site in Austria and also has great meaning for Catholics in the neighboring countries to its east. The object of veneration is a miracle-working image of the Virgin, carved in lime-tree wood. This was brought to the place in 1157, and is now enshrined in a chapel lavishly adorned with objects of silver and other costly materials. The large church of which the chapel forms part was erected in 1644 as an expansion of a smaller church built by Louis I, King of Hungary, after a victory over the Turks in 1363. 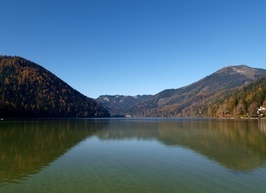 In the vicinity of Mariazell is the pretty Alpine lake of Erlaufsee. 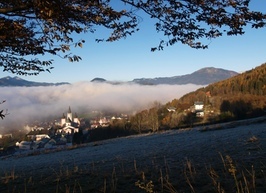 In pre-Christian times and in the first century after Christ there was no trace of large or enclosed settlements in the area of modern Mariazell. The large number of Illyrian and Celtic mountain and river names in the region, such as for example theErlauf, however suggest small settlements by these tribes. The salt springs in Halltal were not unknown to these groups. By 16 AD the Romans were using the salt roads of Halltal and the Traisental. According to some accounts, there also was a Roman road going to Neuhaus. In 600 the Slavs, under the leadership of the Avars, took control of the land and settled in the mountain region and began farming. The expansion of these peoples also accounts for the existence of some of the town and mountain names today. In 1025, Emperor Conrad II gave his sister-in-law Beatrix, married to Adalbero of Eppenstein, parts of the county in the Mürztale as a gift. With this gift came around 100 Huben,[clarification needed] which belonged to the territory of the future market of Mariazell. There was an argument for one year over this gift involving the Reichsgericht and even the Pope. Eberhard,Archbishop of Salzburg, decided in 1151 in favor of the Monastery of St. Lambrecht. It was allowed to control part of the parish territory of Mariazell and the of dominion of Aflenz. The date, December 21, 1157, is taken off a document from Pope Adrian IV, still traditionally celebrated as the date of Mariazell's establishment, even though it cannot be proven historically. In 1157, Monk Magnus came into the Zellertal with a lime-tree wood statue of the Virgin Mary and founded the first chapel there, around which the town later grew. The town's name derived from the description "Mary in the cell", i.e. in the monk's chapel. 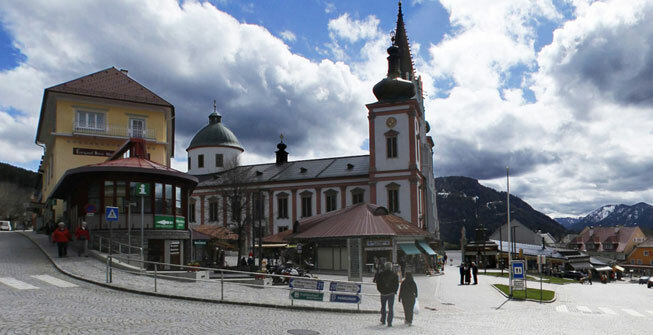 In 1344, Mariazell was elevated to the status of market town. Between 1340 and 1380, the church was rebuilt in the gothic style. In 1420, the Turks came to Mariazell for the first time and burned the church and the town. In 1474, another fire devastated the town. In 1532, the Turks returned to Mariazell and set more houses on fire. 1644: The "baroque-ization" of the church is begun by Abbot Benedikt Pierin, and the commission is given to Master Builder Sciassia. After his death the construction is continued by various other workers before being completed in 1780. 1679: Emperor Leopold I visits the shrine, and a valet in his entourage brings the plague to Mariazell. Fear and terror take hold as 156 townspeople fall victim to the disease. 1683: Fears of a new Turkish invasion cause the holy statue as well as the treasury images to be sent to St. Lambrecht, from which they were returned later that year. 1742: The Empress grants Abbot Eugen Inzaghi the privileges of an Archabbot over Gollrad and Aschbach, as well as over the Mariazell cast iron works. 1786: Emperor Joseph II dissolves the Monastery of St. Lambrecht, from which Mariazell was serviced, in the course of his cloister abolishments. The pilgrimages are hampered and later completely forbidden. 1798: A conflagration destroys the town; the area of Wiener Straße is especially hard hit. 1805: The first French invasion and combat operations occur in the area of Mariazell. 1809: Faced with the French advance, church treasures are brought to Temesvár in Hungary for security. A few weeks later, the French arrive at Mariazell. Combat operations, requisition, and crop failures lead in these years to a massive decrease in population. 1816: A great famine takes place. Archduke Johann introduces the potato and plants it in the poor fields of the area to combat hunger. 1818: Archduke Johann buys the Brandhof. 1827: Mariazell's largest fire, which incinerates almost the entire town, and leaves the church with great fire damage, occurs on All Souls' Night. 1828 - 1832: The town is rebuilt with great hardship and suffering. 1892: The idle boring machine of the cast-iron factory is converted to a power plant; the following year, Mariazell gets electric power for the first time. 1896: The building of the first public water service begins. 1898: The Mariazell cast iron factory is shut down. 1907: The Mariazellerbahn, finished the previous year, is opened for public transport. That same year, the Mariazell Basilica is elevated to a Basilica Minor. 1911: The Mariazellerbahn becomes electric. 1924: The first festival in the newly built festival theatre is begun. 1925: The festivals reach their high point. In the following years, financial decline brings them to an end. 1928: A gondola to the Bürger Alps becomes the first funicular to be built in Austria. That same year, the water system in expanded around the "Student-Quelle". 1945: The Red Army enters Mariazell and takes accommodations for 5,000 men. 1948: Mariazell is elevated to the status of a city. 1955 - 1957: A general restoration of the church takes place. During these years, a by-pass and a new post office are built. 1966: The fathers of the Kremsmünster Monastery separate from the fathers of the Schottenstift, who had been in charge of the ecclesiastical leadership of Mariazell since 1949. In the following years, extensive restoration work is done on the church, thepriory, and the nearby chapel. The new rosary path is also built during this time. 1976: Mariazell gains an indoor swimming pool and, a few years later, the enlargement of its Hauptschule. 1983: Pope John Paul II visits Mariazell. The papal altar is built in the main plaza. In the course of this great event, the entire city receives a façade facelift, the main plaza is redesigned, and parks are created. 1990: Thanksgiving and freedom pilgrimages from the former Eastern Bloc states bring 25,000 participants to Mariazell. 1992: The Bendictines of Kremsmünster transfer the duty of pastoral care for the pilgrimages into the custody of the founding monastery and mother cloister of St. Lambrecht. 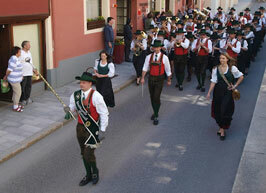 2004: Central European Catholic Day - a pilgrimage of the people to Mariazell brings over 100,000 visitors. 2007: Pope Benedict XVI visits Mariazell to celebrate the 850th anniversary of the foundation of the Shrine of Mariazell. Most notable about the Mariazell Basilica, built in the 14th and 15th centuries but with a superb baroque interior, are the three towers on its western front. The church houses the Magna Mater Austriae ("Great Mother of Austria") in its so-called Gnadenkapelle. The holy image is a small wooden Marian statue from the 13th century, which is clothed in a splendid garment and plays a great role in the popular devotions of many Austrian Catholics. Mariazell lies on the highway B 20, which goes from St. Pölten over the Seebergsattel to Kapfenberg im Mürz Valley. 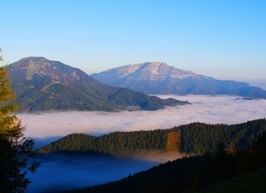 There is a connection through the Salza Valley to the east either over the Gscheid to St. Aegyd am Neuwalde, into the Piesting Valley und then further into theViennese Basin (B 21) or over the Lahnsattel into the Mürz Valley and onward to Mürzzuschlag (B 23). Mariazell is also the southern endpoint of the Mariazellerbahn; however, the station lies around 1 km from the city center in the municipal territory of Sankt Sebastian.